Greetings friends, I want present to you the Atikmdag patcher 1.4.6 and 1.4.7, which cancels the driver signature verification. It is very necessary for those who have AMD cards for mining. If you do not see the amd video card after the firmware or drivers are not installed.This patch is for you. After firmware the bios amd it is necessary. The version of atikmdag patcher 1.4.5 is already outdated. You ask for instructions?For what? -Then start, wait when the program will find all the drivers and press "Yes" then wait. And that's it, it's ready! 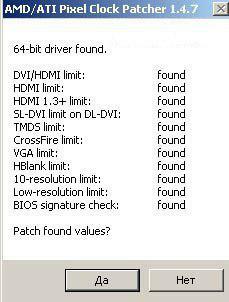 Usually it is required when a driver is not installed on the graphics card from AMD or an error 43 pops up after the firmware. Don't download a virus, 1.4.7 is a virus and was already posted in other bitcoin forums aswell.